I never would have guessed I would spend an entire afternoon glued to the screen watching corporate instructional videos, but these food science equipment videos are fascinating stuff. See peanut butter act like spray paint and learn about how how companies test the strength of pasta noodles. It all started innocently. I read that the Society of Automotive Engineers had a chart measuring the viscosity of different fluids. Peanut butter topped the chart with a viscosity of 250,000 centipoises. Oh, ha ha! So many centipoises! They surely intended that viscosity measurement to be a joke! I searched around a little, figuring that some academics must surely have posted a goofy video of themselves measuring peanut butter viscosity. I found out that peanut butter viscosity is no joke, and fell into the weirdest and coolest YouTube video genre I've ever seen. Companies that sell food science equipment use YouTube to post videos that promote and demonstrate their equipment, and to educate people about their equipment's use. Here we have Spraying Systems, "experts in spray technology," showing us how their nozzles can heat peanut butter until they can squirt it like spray paint. The video is fascinating on its own, but I especially like the practical tips, like how the nozzle allows for "consistent spray coverage" and a "variety of conveyor widths." Campden BRI, "food and drink innovators," has a video up in which they show us how they use machines to take analyze "very clear objective characteristics related to the cell structure and the overall shape of that individual slice of bread." 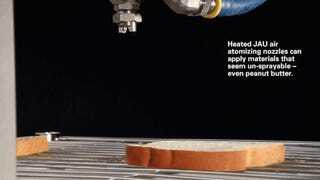 We then see "texture profile analysis," — a machine that squishes a slice of bread — to figure out the softness, resilience, and "butterability" of bread. And then there is Brookfield Engineering, "the global leader in viscosity," which has an actual analysis of creamy style peanut butter viscosity and stress yield up on their site. Oh I could stay on their YouTube page alone for hours. I vacillated for a full ten minutes before deciding which clip show — clip show — I should post. I decided on this one, which shows pictures of the CT3 crushing tomatoes, cutting sausages, and measuring the tensile strength of soft pasta by pulling it apart. Look at it crumbling a cracker! Look at it spearing an apple to test fruit texture! It's worth going to the site and looking at pictures of the same machine testing the strength of a gel cap and running a comb through hair that has been washed with certain shampoos to see how much force it takes. Another video instructs potential clients on how to test the spreadability and yield of moisturizing cream. I think we all know that food science involves getting a lot of variables right — from the firmness of dough to, yes, the viscosity of peanut butter. But seeing the videos, and gaining an appreciation of the very precise ways companies test their products, is both enlightening and a little funny. See how much attention is paid to the smallest details of our life. I'll leave you with a demonstration of how to use CT3 texture analyzer to measure the "firmness and bending force of a lipstick."